"﻿I never knew my teeth could look so good!" Advances in modern dental materials and techniques increasingly offer new ways to create more pleasing, natural looking smiles. Researchers are continuing their often decades-long work developing esthetically attractive materials, such as ceramic and plastic compounds that mimic the appearance of natural teeth. Today, more patients ask us about white fillings because they want their teeth to look natural when they laugh, talk and smile. White fillings, also called composite fillings, are made from tooth-colored materials that restore the natural appearance of a decayed or previously filled tooth. Because they blend well with tooth enamel and don't look like fillings, we may recommend them if the teeth to be restored are near the front of your mouth. A composite filling usually requires only one visit, during which the tooth is prepared and restored. An advantage of composite fillings, as compared with other dental restorations, is that theyrequire less of the healthy part of a tooth to be removed to hold the filling in place. This is due to composite materials' ability to bond to teeth directly. The procedure for a composite filling may take a little longer than those for other types of fillings, because after the decay is removed, the tooth must be kept totally isolated from saliva. We carefully apply an adhesive followed by several thin layers of the tooth-colored composite. Once the filling is in place, it is chemically hardened, or cured, for less than a minute with a special light. Composites are preferable for obvious cosmetic reasons, but if the decayed area is large or is subject to heavy chewing pressure, Dr. Melissa may recommend another type of material or restoration. Some people may experience some sensitivity to hot and cold temperatures in the newly filled tooth for a few days or as long as a week. If the sensitivity continues beyond that time, contact us. While white fillings cost more than silver fillings, most patients find these natural-looking restorations well worth the additional cost. White fillings, like other dental materials, may require periodic replacement. If the edge of the filling eventually pulls away from the tooth, bacteria can get between the filling and the enamel and eventually may cause decay. Tooth decay over time may develop elsewhere on the tooth. Regular dental checkups are important because they allow Dr. Melissa to detect a problem in the early stage. Icon is a new way Dr. Melissa Jarrell can stop the progression of an early cavity before it needs to be treated using a needle or drill. This breakthrough treatment preserves healthy tooth structure, prolonging the life expectancy of a natural teeth and is completed in just one visit. Has Icon been proven effective? Can it really stop lesions effectively? Icon® and the method of resin infiltration has been the subject of numerous international studies which have yielded highly positive results. Studies carried out at prestigious universities confirm the efficacy of the principle of resin infiltration. Independent laboratory studies have been conducted since 2000. Although Icon® has only been available to US dentists since September 2009, the practical application of the product has been tested on patients in clinical studies for over two years. The effectiveness of the product has been confirmed over this period. The results also lead us to draw positive conclusions about the long-term halting of caries progression. The tests were carried out in several countries. For example, studies were started in the U.S (Michigan, Ohio and Alabama), Germany, Greenland and Colombia. Due to the particularly high rates of cavities in the populations where the tests were performed, it can be concluded that Icon® will work particularly well in countries with good oral hygiene standards (e.g. the US). The results of these studies show that by using Icon® the onset of cavities can be halted for many years. 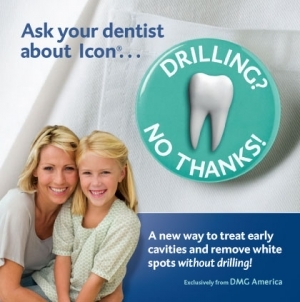 ﻿Does Icon® treatment replace drilling? Icon® cannot be used in cases of advanced decay. This applies, in particular, where the cavity has formed a hole in the tooth. In this case, traditional filling with a drill would be required. The treatment method for "resin infiltration" with Icon® works during the initial stages of cavities. If cavities are therefore detected at an early stage, which requires regular checkups, they can be treated using Icon® without drilling. Icon® is suitable when X-ray findings show mild lesion (early decay) progression; previously there has not been an appropriate treatment for this. Your dentist will be able to discuss the exact uses for it with you. An Icon® based therapy can intervene, where in the past, dentists have lacked a suitable treatment method and could only look on helplessly as early cavities continue to deteriorate until a filling was required. Icon® therefore postpones the need for filling for many years. Is the Icon® treatment painful? Icon® treats early cavities to be treated without pain. No drilling, no anesthetic injection. To apply Icon® between teeth, the teeth need only be separated slightly with a dental wedge. Patients treated with these wedges have described this as gentle pressure. Icon® has been used on children and teenagers in clinical trials. The trial participants did not report any pain. Is Icon® the same as a traditional filling? Icon® is not the same as a traditional fillings, traditional fillings require drilling and require the removal of healthy tooth structure. 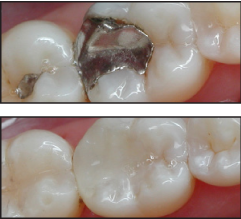 The new resin infiltration method with Icon® means that healthy tooth tissue can be preserved. The treatment is painless and can be done in a single sitting.